At the corners of the triangle are areas that we might focus on during a dialogue. 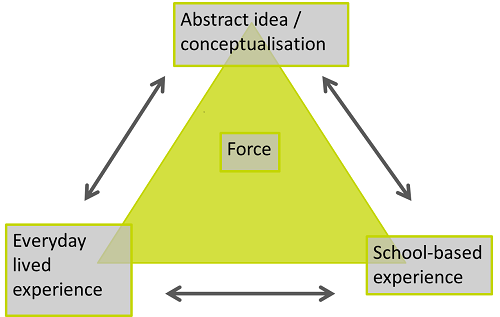 In the centre of the triangle is the concept under discussion – in this case ‘force’. In primary science much time is rightly spent providing children with concrete experiences, which when exploring forces might involve dragging shoes over different surfaces, rolling trolleys down ramps, making model parachutes and dropping differently shaped lumps of Plasticine into a tube viscous liquid. 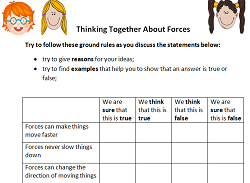 It might also be useful to support the children to conceptualise the idea of force – to have some kind of provisional understanding of what a force is and what it does that will allow them to apply their learning in different contexts. This is where I think dialogue can be useful. What follows is an outline of a session I led with nine and ten year-olds in a primary school in Cheshire recently. 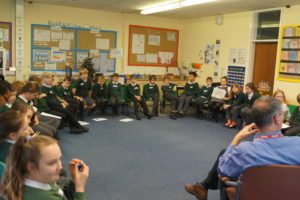 The class were given the opportunity to dialogue in threes around a level of confidence grid and ‘cartoon conversation’. 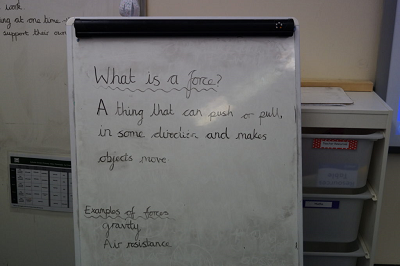 The intention was that they would begin to conceptualise the idea of ‘force’ after spending several weeks learning about forces in their science lessons. 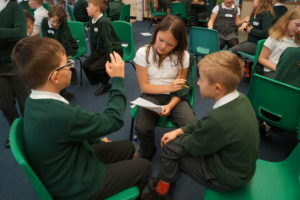 As the children talked I intervened occasionally if a group did not appear to be engaging in true dialogue, but for the most part I wandered around and ‘discretely’ listened to conversations, collecting useful snippets of dialogue to reflect back to the group in the plenary session. Before gathering the class into a circle for our whole-group plenary, I asked them to use their 4Cs ground rules to help them to reflect on the quality of their dialogue. At the opening of the plenary I asked the class to think together to come up with a provisional definition of the term ‘force’. A tentative first response was “A thing that can push or pull.” I offered the class the chance to respond to this opening suggestion. One child wanted to add that “The direction doesn’t matter – it can pull down like gravity or up or in any direction.” We agreed to add the phrase ‘in some direction’ to our developing definition. When the children declined to add anything further I asked “What do forces do? What effects do they have?”. The first response was “They make things move”. There were no dissenting voices, so this was duly added to our definition. During this opening exchange we were focused almost completely in the abstract corner of our triangle. As Sprod says, if we spend too long in the abstract we risk disengagement and the question ‘What’s the use of all this?’; I think we also deny the children the opportunity of making meaning. At this point in our dialogue, I called for examples of forces that the children had learned about, moving the focus to the right hand corner of the triangle. The first example offered was gravity. After a brief discussion of what the children had learned about gravity, we considered whether our emerging definition of force encompassed our understanding of gravity, and agreed that it did. The next example was air resistance. I asked “Does air resistance ‘make things move’?” This led to an extended discussion during which the children drew on examples such as parachutes, golf balls and bike riding, moving the discussion from the right corner of the triangle to the left. They eventually agreed that forces changed the way things moved rather than ‘made them move’. It might have been useful to push for more depth here by asking for examples of ways in which forces change movement. In the event, I asked the children which of friction, magnetism and acceleration was not a force. As we stress in our book being able to distinguish a concept from a related concept (in this case force from acceleration) is a useful part of gaining ‘mastery‘. The children were able to identify that acceleration was an effect of a force. a car standing still outside your house. This was a deliberately stretching question leading the children to realise that there was more to learn about forces, which led into my final rhetorical point that our understanding of an idea like force is never final, but always developing. I hinted at Einstein’s ideas challenging the belief that gravity was a force at all to illustrate that, just as their understanding of big scientific ideas is provisional, so is the understanding of ‘science’ as a whole. I think this is important, as it suggests to children that a subject like science is not ‘dead’ but constantly changing. As always, we concluded the session with some reflection on the quality of our dialogue, agreeing a ‘4Cs focus‘ for the next session. I think using a ‘focus triangle‘ to guide our dialogue helped the children to make meaning by setting up an interplay between their experiences in school, their lived experiences and their developing understanding of a key concept. In addition, the whole session provided a ‘window‘ onto the children’s understanding of force, giving the teacher the opportunity to respond both within the dialogue and in future planning.